Israeli soldiers invaded and violently searched, on Monday at dawn, dozens of homes in occupied Jerusalem, and abducted at least ten Palestinians, in addition to summing one for interrogation. 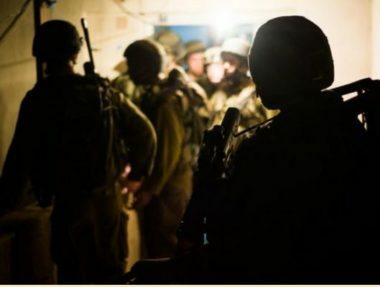 Media sources said the soldiers interrogated many Palestinians while searching their homes in the towns of al-‘Isawiya, Silwan Biddu and Beit Anan, in addition to the Old City, and inspected their ID cards. They added that the soldiers abducted Tawfiq Othman, Abdul-Rahim Khalil Abbasi, Nidal Sufian Natsha, Tareq Sa’ada Abbasi, Majd Ahmad al-A’war and Mahmoud Najib al-A’war, from their homes in Silwan town, south of the Al-Aqsa Mosque. Also in Silwan, the soldiers summoned Mohammad Shweiki for interrogation at a military base, in occupied Jerusalem. The soldiers also abducted Omar Abu Sneina, from the al-‘Isawiya town, while Wisam Hussein Rabea’ was taken prisoner from his home in Beit Anan town, northwest of Jerusalem. Furthermore, the soldiers invaded Biddu town, northwest of Jerusalem, and abducted Hashem Hmeidan.